I’m on this whole “Jordan stop eating sugar” kick which means no waffles, no bagels, no honey nut cheerios for a while… and I just adore breakfast but I’m okay with that. I have accepted it. I would really like my face to clear so I have to pinpoint why it’s breaking out. Is it the sugar? Dairy? Stress? Pasta? I’ll find out! So for breakfast I’ve been making smoothies 2-3 times a week. This was Friday’s Smoothie which I absolutely loved! Let me explain: I hadn’t planned to put this up which is why there are no portion sizes! and I didn’t have fresh pineapple or peaches which is why I used my frozen fruit. BUT by all means use fresh fruit! I’m not a huge berry lover hence…no black or raspberries. I’ll redo and measure everything carefully…I guess for yall I will. Kale is SOOOOOOOOOOOOOOOOOOOOOOOOOOOO beneficial. The nutrients provided in kale are plentiful [ another day I’ll discuss all things positive about these little green curly leaves.] The only negative thing I would say about using kale is that the whole drink would turn green..but get over it and juice the little leaf. Focus on the positives: you’ll be getting a couple of servings of fruits early in the AM, you’ll feel great && it’s a healthy breakfast easy to take on the go. 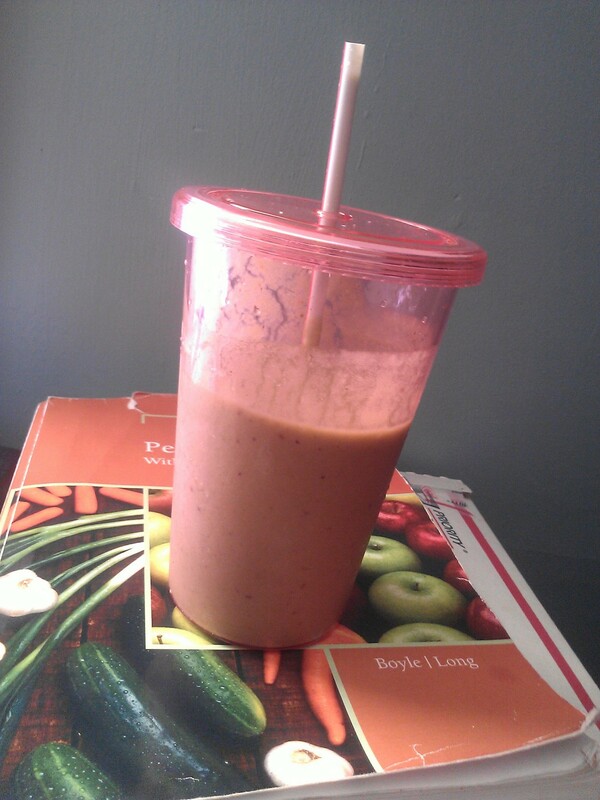 I actually don’t know why I put the protein as optional…every single ingredient in this smoothie is optional. The whey can help if you are working out and need a post-work out snack. You can add stuff, take away stuff.. ..
…Explore. Create. Be healthy. and oh yea..share your recipes! It was too good and this container is just awesome. This entry was posted in Nutrition, Overall Wellness, Recipe and tagged breakfast, fruit, healthy, kale, post workout protein, smoothie on 04/21/2012 by The Tenth Muse.